While the minimum system requirements may look pretty high an i5-6500 paired with a good graphics card and enough memory should be enough to run the game at very high framerates with really good graphical settings. Overall most settings will generally not change the look of the game by that much, most settings can easily be hand picked and optimized in order to get the highest possible framerate. 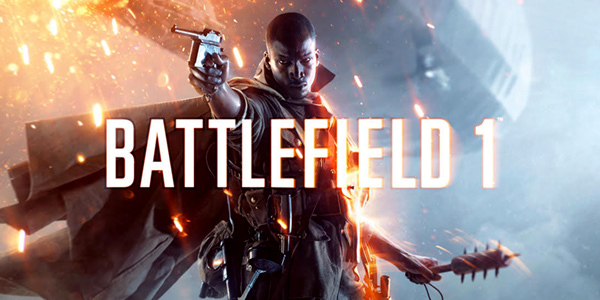 Battlefield 1 can often use up to 3 GB and even up to 5 GB of RAM, systems with limited memory might perform poorly, heavy stuttering might also be present unless more memory is installed. Players are unable to access the main menu right away on launch, they'll be transported into the single player campaign instead, the options menu should eventually become accessible however. There aren't too many video options, the depth of field effect, which is heavily used on most menus cannot be disabled, it is often the cause of large performance issues, which could be a big problem on lower end systems, it also misleads players into thinking that their framerate might be worse when in reality their in-game framerate might be much better. Overall most settings don't change or improve much. There's no control over the tinting effects the game uses, the sun glare effects also cannot be disabled although these are minor things and aren't too important. There's a lack of a draw distance setting which would've greatly helped, by default the standard draw distance is extremely small, even when enhanched with other settings, the antialiasing modes often might fail to hide some of the problems the new rendering engine has, with lots of objects fading out of nowhere or too close to the player's view. This issue is prevalent on the Amiens map, where windows and even certain walls will often change out of nowhere as the player gets closer, however Mount Grappa and other similar maps handle this slightly better. On the other hand, there are a lot of options related to the gameplay such as plenty of mouse and keyboard options, extensive audio settings and ways to disable the heads up display and other similar things. After reaching the main menu, open the options menu by clicking on More located on the top right or on the gear icon located in the center left area under the Shortcuts title. Only values between Vertical 50Â° and Vertical 105Â° can be chosen which translate into Horizontal 64Â° and Horizontal 120Â°. The vertical values are also translated as horizontal values in the options menu. Written as ADS Field of View in the options menu. When enabled the game will replace the zoom in effect while aiming with the desired Field of View value. Otherwise when set to Off the weapon will zoom in as usual instead. This can be useful to see more things in a larger area and it shouldn't impact the performance. Things will look smoother while moving the camera around but visibility may be slightly reduced, there's a huge performance drop for such a simple setting however and in most cases it's not worth using. The effect itself can be pretty subtle when set to values between 10% or 15%. Some artifacts might be present when using the highest value. To disable this setting find the options menu located in the top right corner labeled as More then under Options select Video and set Motion Blur to 0%. This setting should be disabled in order to obtain higher framerates and to keep the image clear. Otherwise, this mostly comes down to user preference. The depth of field effect can only be partially disabled. While the game is paused the overall framerate might be lower, this issue is only present on certain maps however. Close the pause menu before checking the framerate number. The framerate might also drop every time the pause menu is brought up, once the pause menu is closed it might take a few moments for the game to stabilize. Weapons have their own depth of field setting, this effect is only applied while aiming and while in a vehicle. To disable this setting find the options menu located in the top right corner labeled as More then under Options select Video and set Weapon DOF to Off. This setting should ideally be disabled seeing as it has a negligible visual impact. Use the DirectX 11 mode if possible, on a few specific maps the framerate might be lower while in the loadout area, however it should be fine while actually playing, overall this mode should be more stable and the game should run well either way. The DirectX 12 mode can achieve higher framerates but certain maps have some performance issues which can lead to random microstuttering, there's also a minor issue where the framerate might drop while spawning. While using both modes microstutter might be unavoidable on maps such as Amiens and Empire's Edge, while maps such as Mount Grappa perform as they should. On Empire's Edge the framerate might often drop while inside one of the main buildings, this same building is also present on Mount Grappa where there are no performance issues. Lowering the graphical settings on some of these maps might not solve the problem itself. Otherwise try setting the Lighting Quality to High or Low or try lowering the Mesh Quality and even most settings to Medium if needed while playing on Empire's Edge if the framerate drops and if the stuttering become unbearable. Amiens has a few specific spots where lowering the Mesh Quality might very slightly help, although the microstuttering shouldn't be as noticeable if the DirectX 11 mode is being used. Running around in circles while in the DirectX 12 mode in certain areas in the Amiens map might ruin the frametime and cause microstuttering. This setting controls how many times the resolution should be enhanced, higher values will also very slightly improve the draw distance, the texture filter will be slightly more effective which means that most textures might have a sharper look from far away, the antialiasing techniques are also slightly more effective. When the player is too close to a texture however this effect is lost and the texture will lose most of its sharpness. This setting should be kept at a value of 100% seeing as lower values will ruin the overall image and higher values might be too intensive for certain systems to handle. Lower end systems might need to lower this value in order to gain playable framerates, although there are better settings which can be changed first. Most differences can be pretty subtle when using higher values and they might be difficult to spot during usual gameplay. Notice the door, the extra detail around the door and the stone fence, along with the mountains and the trees in the distance. When using the maximum value this setting can help alleviate the ring effect present on most textures, which is very often visible while strafing left and right or while moving towards or away near a wall. Notice the lamp post on the very far left, which has far less holes while using the highest possible value and how the texture on the wall changes. Often these changes can be less subtle, such as the tree on the far left, its branches are rendered slightly farther while also reducing the amount of jaggies visible to the player. Other subtle changes can be fairly minor but the improvements themselves can be pretty noticeable depending on the model, notice the cables and the crosshair on the gun itself along with the barbed wire on the bottom right. This setting doesn't always help with the draw distance issue however, objects which are just very slightly farther away from the player will be full of holes, even while using the best antialiasing mode. This setting cannot replace the antialiasing modes and instead it should complement them seeing as the resolution scale setting does a poor job at masking any jaggies on its own. This is a pretty unreliable method seeing as it often might fail to even work properly, while the railing here might look perfectly fine, it still often vanished and reappeared very slowly on screen even when it was not supposed to. This setting should only be lowered as a last resort, any values below 100% will heavily ruin the overall image. Any real benefits will only be visible while using higher values. This setting has a relatively minor visual impact, it doesn't affect most textures in any meaningful way. The only things which clearly change are the shadows on the player's weapon. When set to Low every texture will have a slightly lighter look to itself, when set to Medium most textures should have their normal look and when set to High or Ultra some textures may also have better reflections or a higher quality look to them. Certain objects such as these trees may look lighter from far away. Set this value to at least Medium to stop the trees from looking like this. There are a few extremely specific spots where setting this to High will help with the look of the game, otherwise it can even be left on Low and the game itself will not change much at all. There are no clear differences between High and Ultra, this setting could be left to at least Medium to solve the tree issue or High for the extra eyecandy and to save some extra memory. This setting does not solve the texture load in issue at higher settings which is visible while using binoculars or while shooting artillery rounds. This is a minor issue and it only happens for a few seconds. This setting has a minor visual impact while using any values and a minor performance impact overall. Most differences will be pretty difficult to notice from far away. Textures will look very washed out when this is set to Low and overall this setting has a major visual impact for a relatively minor performance cost. Most textures will have a ring effect around them which is mainly visible while strafing left and right or while moving towards or away near a wall. This setting often poorly filters most textures even while using the Ultra setting. See the doorway on the left side in order to find the differences. This setting has a major visual impact and a minor performance impact. When set to at least Medium most differences might become fairly difficult to spot while playing. This setting mainly controls what the shadows will look like and which shadows will be rendered. Extra eyecandy is enabled after using values such as Medium and higher. There aren't too many differences between High and Ultra. The lights themselves are often unaffected. There are a few specific areas where the shadows might be completed disabled when this setting is set to Low which may grant extra visibility. Overall this setting should have a fairly minor performance impact with a minor to major visual impact depending on the map, certain maps often feature very simple blobby shadows, ideally this value should be left on High seeing as maps such as Empire's Edge have a few specific buildings where the performance might be lower otherwise. There aren't any clear differences as to what this setting affects, it didn't seem to have much of an effect over anything, as with most settings Medium or High should probably be enough. Overall there wasn't really any impact over the framerate. This setting controls which objects should reflect into ponds and rivers and other similar water surfaces, certain surfaces are also enhanced. There isn't much of a point in using values other than Low and High for this setting. Overall this setting might feel a bit buggy because of some odd issues on certain maps. There isn't much of a difference between Low or Medium and High or Ultra. Notice the reflection near the shore and the improved reflections on the boat. This setting isn't as noticeable as it may seem when it is disabled, there's also a rather jarring problem where reflections will update too often as the camera moves making them flicker, this happens on High and Ultra. Overall this setting is mostly useful for screenshots, otherwise most maps lack any large water surfaces or any large reflectable surfaces for this setting to be effective. The effect itself is only visible at certain angles, it may also hurt visibility during gameplay. There's also a minor ghosting effect present while laying into ponds and some other mud like surfaces. The flickering effect is also present on vehicles when using High or Ultra. Most vehicles will look slightly shinier, the effect is barely noticeable however and it's not worth using this setting in its current state. Ideally this setting should be left to Low, seeing as overall it has a pretty minor visual impact and it also has a huge performance impact and it doesn't seem to be working properly otherwise. This setting controls the draw distance of most objects and whenever they should cast more shadows, ideally it should be set to at least High or Ultra seeing as anything lower will cause models to appear out of nowhere too often and too close to the player, the increased distance itself is already pretty low and even on Ultra this issue appears too often, lowering other settings just to increase this one is worthwhile as it would make the game more enjoyable to play. Each value from this setting does very little to help, the differences are pretty extreme and it really shows how invasive this issue is when using the lowest values. When using a value higher than Low some extra shadows might be thrown in. In more blocked off spaces the differences won't be very noticeable. Notice the tree and how aggressive the level of detail is, with extra branches being visible on Ultra and other smaller details, along with another tree being rendered on the far left. Objects might constantly appear and disappear as the player gets closer to buildings and other facades. Some textures might also look worse and when this is set to Low models will have fewer polygons overall. On Ultra shadows will be cast farther away and other smaller objects will be rendered earlier, the increased radius is fairly small. Finer details such as branches, cables, pieces of metal will be visible from closer away. The effect of this setting is also visible in the loadout menu, with certain buildings outright disappearing and a lot of detail being lost. This setting has a pretty minor performance impact considering its large visual impact over the game compared to other less important settings. This setting controls the parallax effect for the terrain, which makes rocks pop out and other similar details. There isn't much of a difference between Medium, High and Ultra meaning that this setting can be left on Medium in order to enable the parallax effect. Depending on the area itself this may slightly hurt visibility for some extra eyecandy. Most surfaces will look flatter than usual however when setting this to Low. This effect is widely used throughout the whole game and depending on the area it can either have a major or minor visual impact. Certain areas in the game might not change as badly however, the effect might not be as noticeable while standing. Muddy surfaces will look flattened when this setting is set to Low and tire tracks and other details will be completely lost. On some maps the geometry might be slightly shifted around instead of adding more depth to the terrain. This setting mostly comes down to preference, if a higher framerate is needed set this to Low in order to obtain a more consistent and even possibly reduce or remove any stuttering issues or to at least Medium to enable the parallax effect itself. Overall there should be a pretty decent performance boost when this setting is disabled. Larger open areas might have lower framerates than smaller more enclosed ones with this setting. Different parts of the game are affected differently, the performance can vary. This setting mainly adds shadows to the grass and other small foliage. Higher values control the shadow draw distance. The effects of this setting can be seen on the squad screen, although the shadows might not be applied depending on the current weather. What this is set to mostly comes down to user preference, it has a pretty minor visual impact and it should be disabled if a higher framerate is needed. This setting has a huge visual impact over the game, ideally TAA should always be used because of the extremely poor draw distance. When this setting is set to Off trees will have holes and white dots all over them, even on lower end systems the most basic levels of FXAA would really help with this problem. Even then the antialiasing techniques do a fairly poor job at masking most jaggies, with cables, trees and other similar thin objects looking really odd from very close distances. Notice the lamp posts on the left and how some of them have entire pieces of their own models removed because of the different antialiasing modes. This setting mostly comes down to user preference, although for a better experience FXAA or TAA should be used. Lower end systems might not be able to handle either modes however and should disable this setting in order to gain higher framerates. This setting mostly comes down to user preference, models will have extra shadows which add more depth, some vehicles may look floaty without this setting and certain areas or textures might look washed out, the visual impact can range from minor to major depending on the map or area, interior buildings will also benefit the most. Some levels might not end up looking too different overall, however things might tend to look a bit floatier. Certain levels and most vehicles will benefit from this setting, rocks and other similar objects will look better. This setting might have a major performance impact on slower systems unless other settings are lowered, faster systems shouldn't struggle too much however. These are the optimal settings used for this system, among the most performance intensive settings are Resolution Scale which should be set to at least 100% and Post Process Quality which should be set to Low. Setting the Terrain Quality to Low and the Ambient Occlusion to Off might also improve the framerate and get rid of some of the microstuttering issues. The Motion Blur and Weapon DOF settings should also be disabled in order to instantly gain a few extra frames. An alternative set of settings can also be used, anything below will very slightly change the look of the game. The Texture Filtering setting or the Mesh Quality and the Antialiasing should be given priority if possible. Lowering the Mesh Quality setting and disabling the Ambient Occlusion might help in areas where the framerate might often randomly drop. Overall the game should still look mostly the same. Gameplay was overall really smooth even with the occasionally frametime delay now and then. The general performance is highly dependent on which map is currently being played on, certain maps, even though they shouldn't, might do worse than others. Lowering most graphical settings might not help with this issue. There are plenty of extra options, if anything there are more gameplay options than video options. There's plenty of freedom as far as to how and which keys should be assigned, the same keys can even be assigned to the same actions if needed. Extra mouse buttons can also be easily assigned on their own separate slots. There are racing games who wish they had this much control over their input methods. For smoother aiming Raw Input should be enabled, which should ideally eliminate any mouse acceleration and provide improved mouse aiming in most cases. Custom controls schemes can also be set for the controller, the settings are not limited to the presets. Click on the arrows until Custom appears, then select Back and open Key Bindings, then navigate to the desired category and set the desired controller buttons under Stick. The heads up display should be fairly customizable. Most notifications and other tutorial annoyances can be disabled. There are a fair amount of audio settings and there's also an audio setting for the language, however currently the display language cannot be changed which is strange considering how many options there are. Some players might be stuck with the first language they picked when they first installed the game, contacting the EA support might be the only solution in this case and its worth trying.